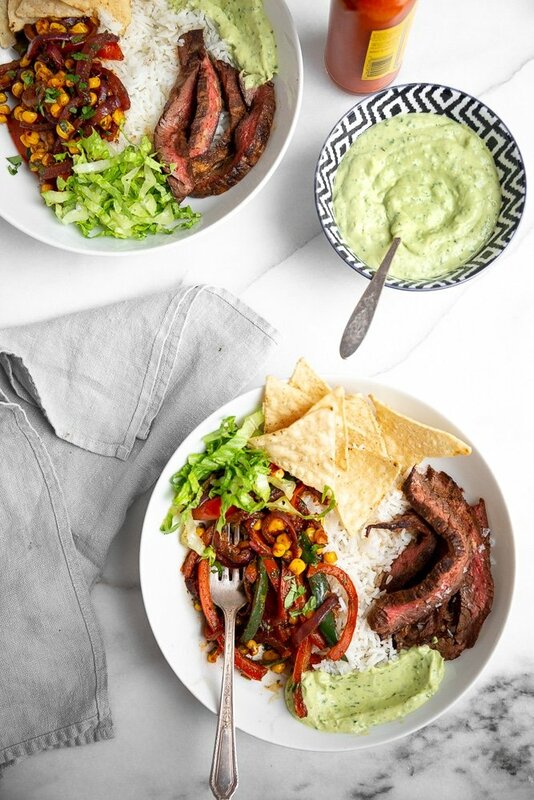 With caramelized veggies and a cool avocado crema, these are the ultimate steak burrito bowls. 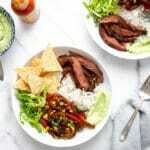 These easy-to-make steak burrito bowls are one of my favorite dinners, and I hope you’ll love them too! 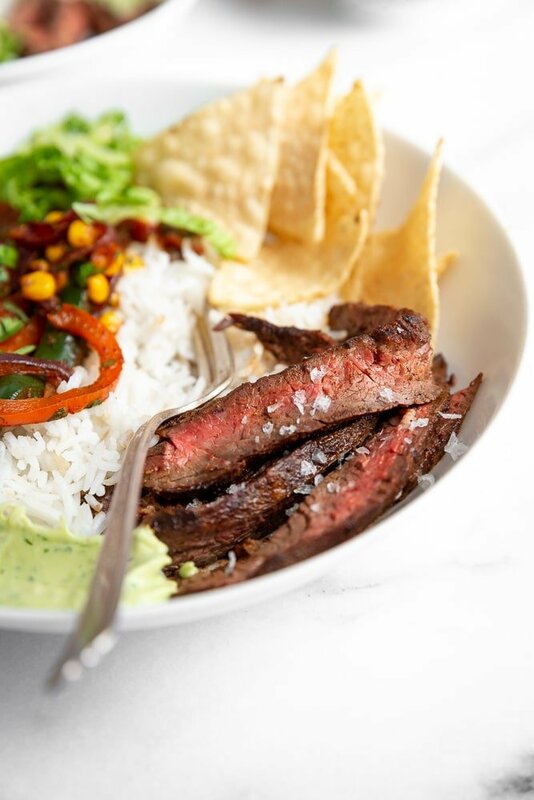 Spice-rubbed skirt steak gets served with a tangle of caramelized peppers, onions and sweet corn, with a creamy avocado sauce to tie everything together (new video below!). The recipe was inspired by the Chicken Burrito Bowls in my book, Build-a-Bowl, which have been a weeknight staple around here for years. A while back I decided to change things up, swapping out the chicken thighs for skirt steak (although you can totally use chicken in this recipe if you prefer!). I also amped up the flavors by using a smoky-sweet spice rub, as well as by incorporating a mix of fajita-like veggies, which cook in the same skillet as the steak. Finally, instead of making a lime sour cream sauce and guacamole, like I do for the chicken burrito bowls, I combined the two into a creamy avocado sauce. MAJOR WIN!! We pile everything over rice or quinoa, but they’re also delicious wrapped up in tortillas. 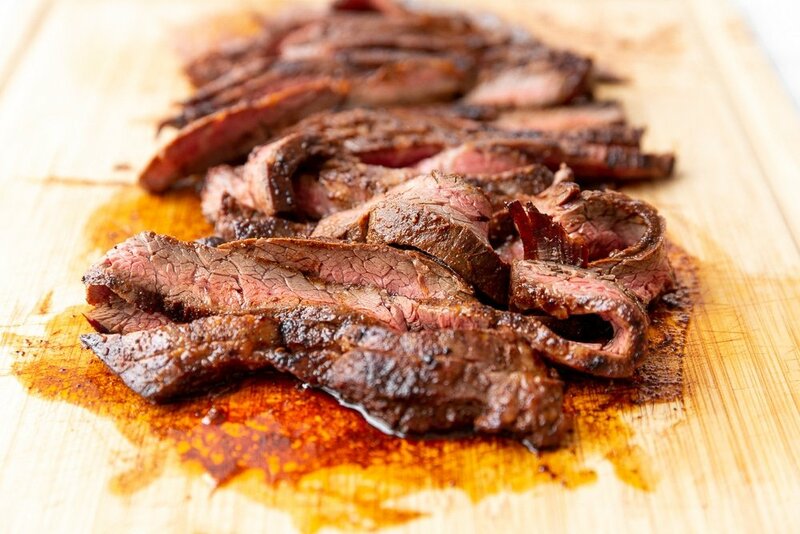 Skirt steak is one of my favorite cuts of beef since it’s so flavorful and easy to cook. 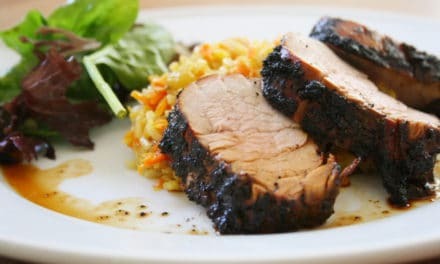 This version gets slathered in a quick spice rub of chili powder, cumin, coriander, cinnamon and brown sugar, lending the meat an irresistible smoky-sweet-umami flavor. It’s worth making in its own right. Since skirt steak is so long, I cut into thirds before cooking it. There are a few benefits to doing this. The smaller pieces are much easier to work with. You have more cooking control—skirt steak tends to be thin on the ends and thick in the middle, so you can pull off the thinner pieces early. You can cook the pieces to different rates of doneness according to different preferences (say, medium for the kids and medium-rare for the adults). The steak pieces are quickly seared in a cast iron skillet, which creates a delicious caramelized crust. Don’t be afraid to move them around and flip them while cooking—you’ll end up with more even browning. After the steak comes out of the pan to rest, a mix of onion, peppers and garlic go right in. 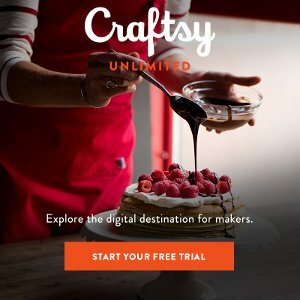 Not only does this save on dishes (hallelujah! ), but those browned bits on the bottom of the pan give the veggies loads of flavor. 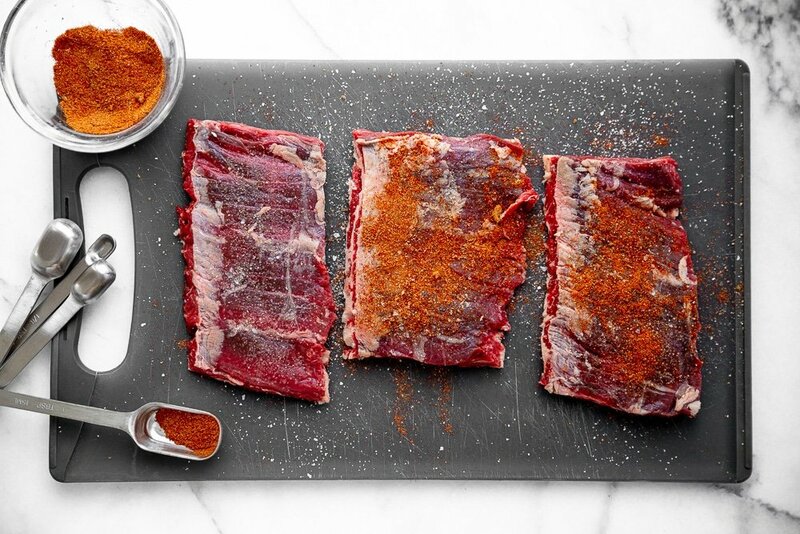 They’re also sprinkled with some of the reserved spice rub for an even bigger kick. Frozen sweet corn lends a bright pop of sweetness at the end. As you probably know by now, I’m alllll about sauces, and this avocado crema is like the love child between guacamole and lime sour cream. It provides the perfect amount of creaminess to these bowls and is also delicious on tacos. I hope you’ll skip the take-out and make your own steak burrito bowls instead! The skirt steak gets cooked in a large cast iron skillet, which provides consistent, hot heat. You can grill the steaks instead, but you’ll miss out on all those browned bits on the bottom of the pan, which will flavor the vegetables. Feel free to swap out the skirt steak for boneless, skinless chicken thighs! The best way to check for doneness is with a good instant read thermometer (this Thermapen is one of my favorite kitchen tools!). For medium-rare, cook the meat to 130 degrees F (135 degrees F for medium). If you’re using chicken thighs, cook them to 165-170 degrees F. Be sure to let the meat rest before slicing. 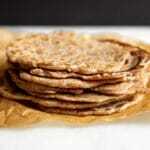 For the most tender results, you want to slice the steak against the grain. The grain in skirt steak runs crosswise, so you actually want to slice the meat lengthwise (check out my video below to see what I mean). 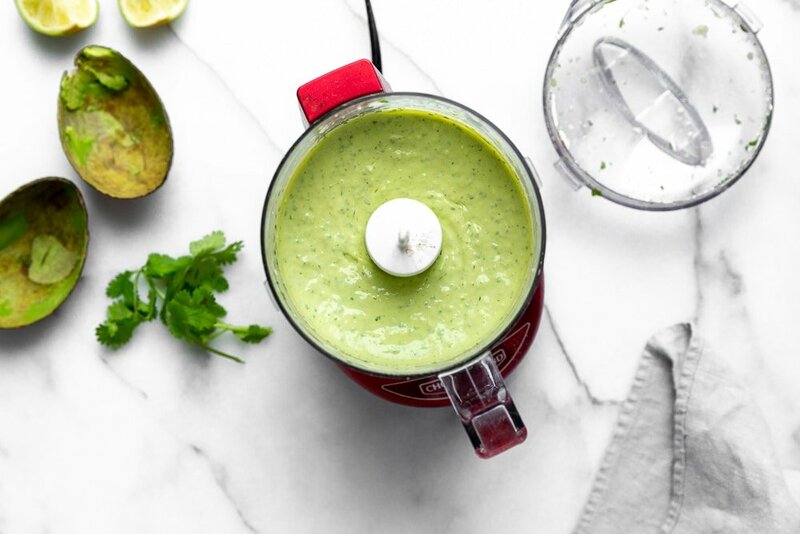 The avocado crema gets made in a mini food processor (you could use a larger model instead). I use mine all the time for sauces, dressings and marinades! 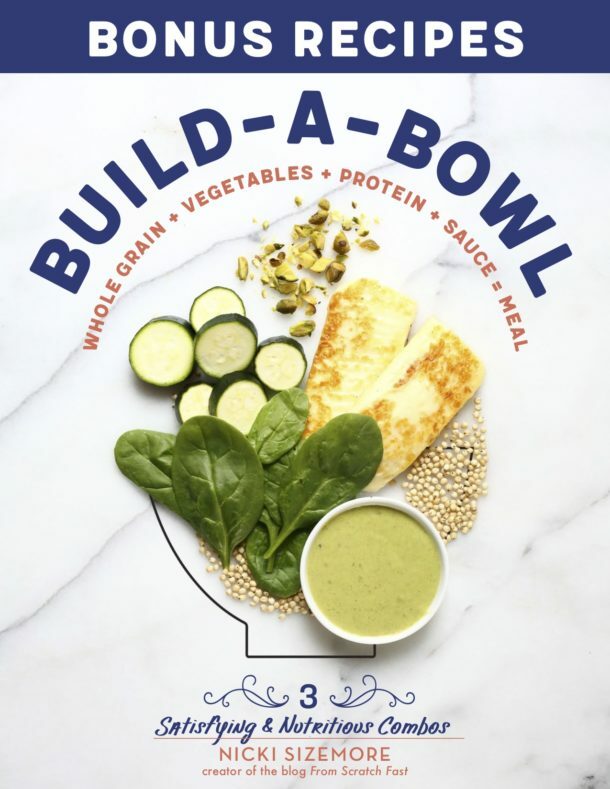 Find a ton of other one-bowl-meal recipes in Build-a-Bowl! 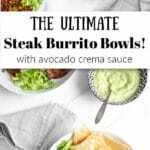 These easy-to-make steak burrito bowls are one of my favorite dinners, and I hope you’ll love them too! 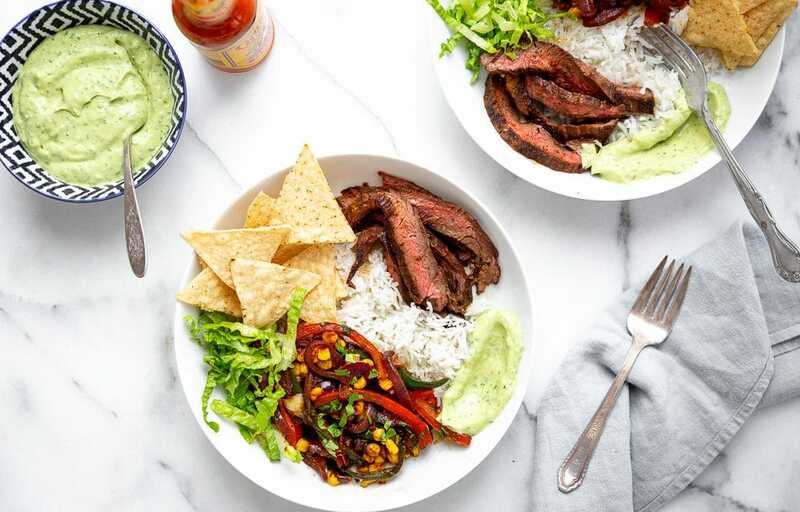 Spice-rubbed skirt steak gets served with a tangle of caramelized peppers, onions and sweet corn, with a creamy avocado sauce to tie everything together. 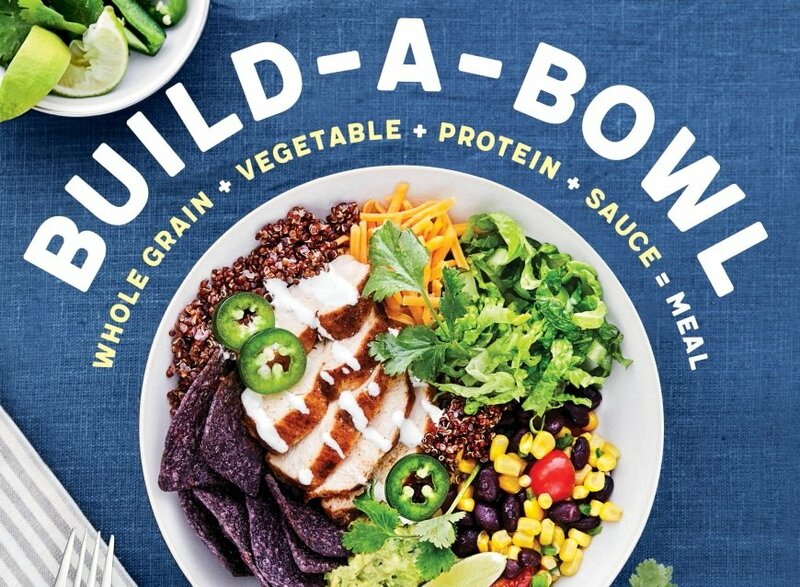 The recipe was inspired by the Chicken Burrito Bowls in my book, Build-a-Bowl. I swap out the chicken for skirt steak and amp up the flavor with a smoky-sweet spice rub (the steak is worth making in its own right, even if you don’t make the bowls). 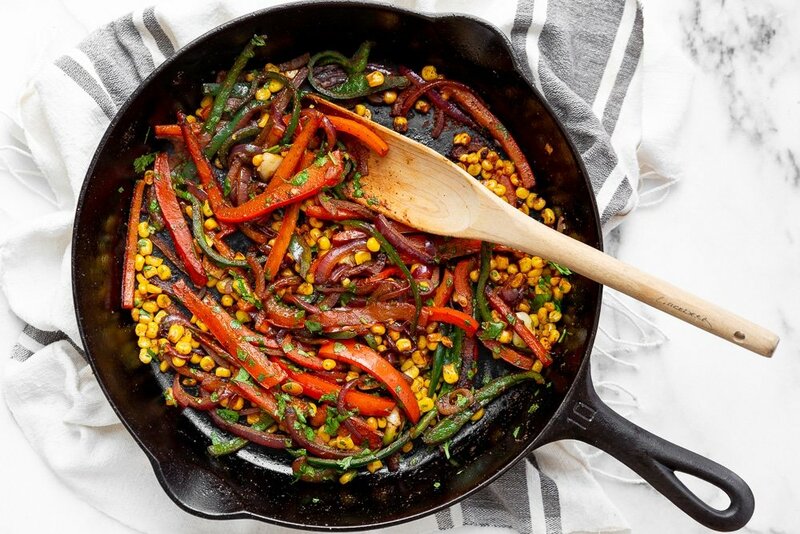 I also incorporate a mix of fajita-inspired veggies (which get cooked in the same pan as the steak!). 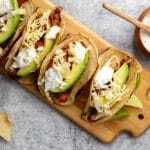 The avocado crema sauce is like the love child between guacamole and sour cream and is also amazing on tacos. 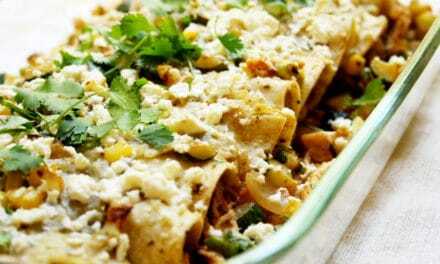 I love to serve all of the components over grains for a one-bowl dinner, but they’re also delicious tucked into tortillas. 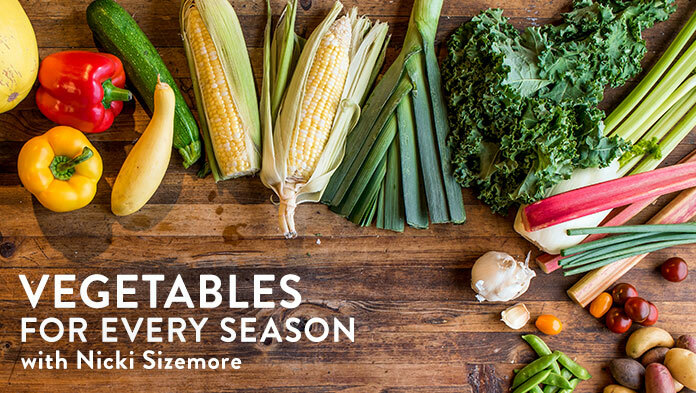 Feel free to swap out the skirt steak for boneless, skinless chicken thighs. In a mini food processor, process the garlic until finely chopped. Add the cilantro, and process again until chopped. Scoop in the avocado flesh, and add the sour cream, lime juice, water and a dash of hot sauce. Season with salt and pepper. Process until smooth. Taste and adjust the seasonings as needed, adding more hot sauce or water as desired (the sauce should be spoonable). Transfer to a bowl and cover with plastic wrap (if making ahead, refrigerate until needed). 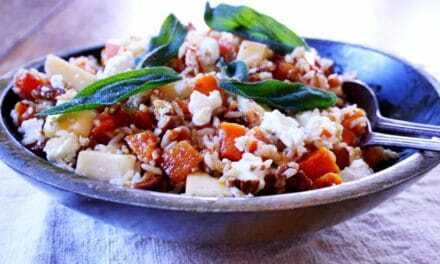 In a small bowl, mix together the chili powder, cumin, coriander, cinnamon and brown sugar. Season the steak pieces with salt and pepper on both sides, and sprinkle with 1 tablespoon of the spice mix (reserve the rest of the spice mix). Heat a large cast iron skillet over medium-high heat. Once hot, add the oil. Arrange the steak pieces in the pan (if your pan isn’t big enough, do this in batches). Cook until browned on the bottom, about 3 to 4 minutes. Flip and cook until done to your liking, about 2 to 4 minutes longer for medium-rare (the internal temperature should read 130 to 135 degrees F for medium-rare). Transfer the steak to a cutting board (reserve the skillet). In the same skillet, add the onion, peppers and garlic. Season with salt and pepper. 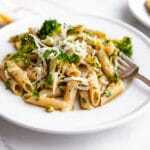 Cook over medium-high heat, stirring occasionally, until the vegetables are browned and tender, about 5 to 7 minutes. Add the corn and the remaining spice rub. Cook, stirring, until the corn is warmed through, about 1 to 2 minutes. Remove the pan from the heat and add the lime juice and cilantro. Season with salt and pepper to taste. Thinly the steak against the grain. 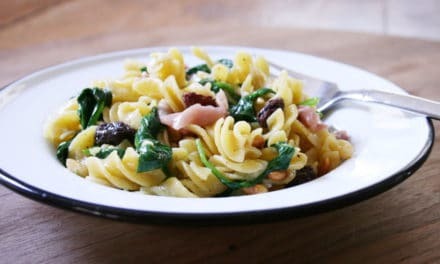 Spoon the grains into bowls, and arrange the steak and vegetables over top, along with the shredded romaine lettuce and tortilla chips. 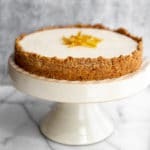 Drizzle or dollop with the avocado crema. Serve with hot sauce. Do Ahead: The avocado crema can be refrigerated for up to 1 day. Place a piece of plastic wrap directly on the surface of the sauce to prevent browning.